Bottles Of Hope By Peter Sid from peter sid on Vimeo. 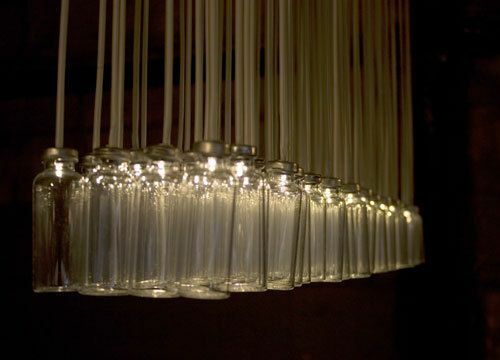 Peter Sid wrote in to tell us about his “Bottles of Hope” chandelier that he has entered into a design contest at Apartment Therapy. We’ve embedded Peter’s slideshow video above. If you can’t see it here, you can click here to view it at Vimeo. And, if you look closely, you might spot the Peggy 2LE that he used to drive his LEDs. Voting for the contest is this week, and I’m sure that Peter would appreciate your vote. This entry was posted in Art, Everything Else and tagged art, LEDs. Bookmark the Permalink. Thanks Windell and the rest of the Maker Community!!! With your help I am very much in the running to win this! Not only that it has a very inspired meaning behind it (never heard of bottles of hope before) but it’s also extremely cool looking. Would definitely use this in my apartment.